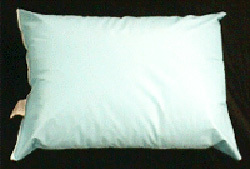 Our most versatile pillow, the outer cover is 50% polyester / 50% cotton. It is generously filled with 100% hypoallergenic polyester fiber. This item is available in Standard, Queen and King size. 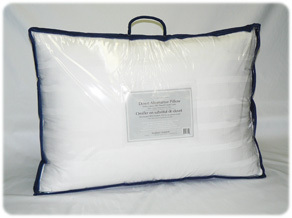 Our healthcare pillow features a 100% vinyl cover and is filled with 100% hypoallergenic polyester fiber. Its wipe clean cover makes it the ideal choice for healthcare institutions. This item is available in Standard size. This higher end pillow is carefully crafted using 100% cotton 233 TC fabric. It is filled with 100% antibacterial cluster like polyester fiber. The piping gives this pillow a distinct look and the highly resilient fill makes it the preferred choice of hospitality establishments. Available in Standard, Queen and King sizes. 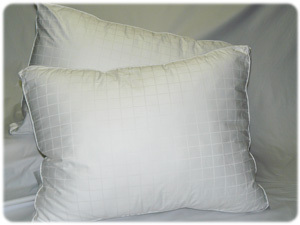 This luxurious pillow features a 100% combed cotton 300 TC fabric cover with sateen piping. It is generously filled with 100% down like, antibacterial polyester fiber and sports a 2” gusset for ultimate comfort. Boutique hotels and higher end establishments appreciate the superior quality of this unique pillow. Available in Standard and Queen sizes. Great for allergy sufferers, our wool pillow features a 100% cotton casing and is filled with carded 100% New Zealand virgin wool. Wool is a natural, non allergenic fiber that absorbs excess moisture and releases it into the atmosphere, maintaining a dry environment which prevents the buildup of dust mites and other allergens. Wool fiber breathes and can absorb up to a third of its weight in moisture without becoming damp. One of the unique characteristics of wool fiber is that it is naturally flame resistant. This is the ultimate pillow for people who are sensitive to chemically produced synthetics. Available in standard size. Our odorless natural pillow features a 100% cotton 250 TC feather proof cover and is filled with a lofty 95% feather 5% down mix. 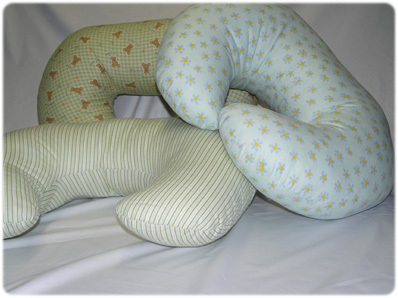 Feather pillows are fluffy and long lasting and provide the ultimate sleeping comfort. 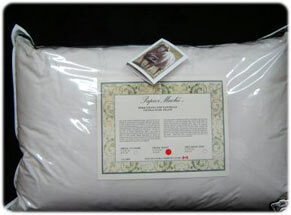 Our feather pillow is designed to offer medium to firm support and meets the strictest quality requirements. Available in Standard, Queen and King sizes.